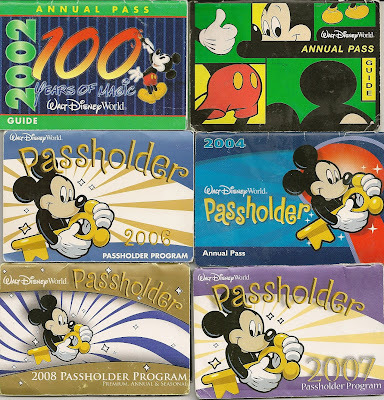 Home � Park Tickets , Trip Planning � Disney World Tickets - When Do Annual Passes Make Sense? Disney World Tickets - When Do Annual Passes Make Sense? Determining what type of park ticket to get for your Disney World trips can be a difficult decision if you are a frequent visitor. Not only do you have to look at all of the Magic Your Way ticket packages, you have to work the Annual Pass option into the mix. Let's take close look at the numbers to help determine, when an Annual Pass makes good sense to buy. All of the numbers that I am reporting are prices without tax. The Annual Pass currently lists for $469. The green areas show where the totals are less than the price of the Annual Pass and the red shows when that option is more than the Annual Pass. To get your money's worth, you definitely need to plan on taking 2 or more trips within a one year period. In the 1st table you can see that if you get the Park Hopper option (which is built into the Annual Pass), the Annual Pass option is better than buying tickets twice, and is only a slight penalty compared to not buying the PH option. The interesting comparison is in the 2nd Table. This looks at buying MYW tickets with the No Expiration option. If you plan on spending 10 or fewer days in the parks during the one year period, you are better off not buying the Annual Pass and just getting the number of days required with No Expiration during your initial trip for the year. The other positive with this choice is that if you have to delay or cancel your 2nd trip, your tickets do not expire and you can reschedule your 2nd trip at your leisure. If you plan on spending more than 10 days in the parks within a 365 day period, then the Annual pass definitely is the way to go. The other benefit with the Annual Pass is that you are not afraid to "waste" a day in the parks by only going to a Park for dinner or just an hour or two. This is a nice option to have on your arrival or departure days. It can also make for a more relaxing experience so that you don't have to closely manage your days. That way if you initially planned to not go to the parks on a certain day and just go to the pool or shopping, you could change your mind or just go to the parks for a little while without any penalty. If you plan on spending 10 days or less in the parks during a 365 day period or unsure if you will be able to take that 2nd trip, look closely at the MYW tickets with the No Expiration option. If you are spending more than 10 days go with the Annual Pass. 0 comments to "Disney World Tickets - When Do Annual Passes Make Sense?"